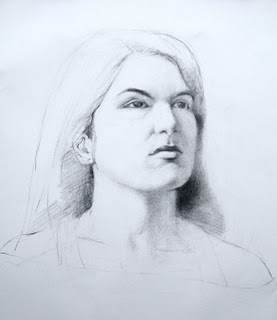 This is the third, four-hour session of a drawing I started two weeks ago on April 5. I have finally, just in the last hour of the session, started applying values. I am struck by how much easier it is to make tonal decisions, once I have already made so many decisions about proportion and placement. Still, despite my hours of attempting to be precise, I have still managed to set the right eye slightly higher than the left. I think it's a minor adjustment, but I am glad I am not any further along with the tonal rendering. The more charcoal on the page, the more there is to erase. As you can see, the model has a very striking face. When I asked she said she is half Peruvian, plus a lot of other nationalities including Greek. Something about the deep shape of her chin, and the sculptural quality of her top lip, gives her a classical look. In other news, construction on the art shed has not begun yet, but I am assured that building will start very soon. In the mean time I'm having fun picking out my skylights. It will be tiny studio, barely 6 feet x 16 feet, but with THREE north-light skylights. I can't wait. If you get your studio built before I do... let's just say someone will be throwing a tantrum.